Buy live Kenyi Cichlids from a trusted breeder. All orders shipped to your door with a live arrival guarantee. Any fish that are DOA can be replaced or refunded. The Kenyi Cichlid, or Metriaclima lombardoi, is a species of Mbuna that is native to the rock-filled shallows around Mbenji Island and Nkhomo reef in Lake Malawi, in Africa. They are popular in home aquariums because of their stunning coloring; males are a vivid yellow with faint to invisible vertical stripes and females are a metallic blue with similar black vertical stripes. These fish can grow to be up to 6" long in a home aquarium. Kenyi cichlids, much like other Mbuna, are territorial and can display high levels of aggression to other species in the aquarium. Due to their aggression levels, it is recommend that they are only keep other types of cichlids which are similar in size and temperament. When kept in a species tank it is a good idea to have only one male Kenyi cichlid with several females, and a tank that is at least 55 gal. in size. If mixed with other Mbuna, the tank should be 90 gal. or larger to give the fish territories to claim. Some compatible Mbuna are the Auratus cichlid, the Bumblebee cichlid, and the Polit cichlid. A 50 gal. tank is the minimum size needed to keep a Metriaclima Kenyi Cichlid. However it is highly recommended to choose a tank that is larger than 55 gallons. These Mbuna are used to rocky shores in the wild and will thrive in a tank that is long and will provide ample room for bottom exploration. Be sure to decorate the tank with a variety of caves, rocks and hiding spaces. Ideal water conditions should mimic the hard water of Lake Malawi. Tank water should be around 78 - 82°F, with a pH of between 7.8-8.6. Additives like Cichlid Lake Salt and Malawi/Victoria Buffer will condition the aquarium water for African cichlids. The Metriaclima lombardoi is a herbivore with algae as it's primary source of food in the wild. In a home aquarium this cichlid will do best on a diet that is made up of primarily vegetable foods with some protein mixed in. 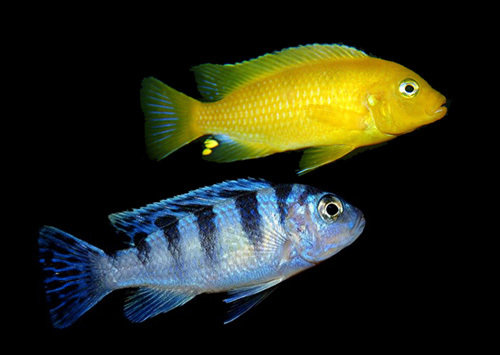 Commercially prepared vegetable-based flake foods mixed with algae wafers and a source of protein will bring out the best colors in Kenyi cichlids. Cool video of Metriaclima lombardoi, Kenyi cichlids feeding. You can see some of the males changing color from metallic blue to yellow. Kenyi cichlids are a sexually dimorphic species of Mbuna. When they are young, both males and females will display the metallic blue colors with black vertical stripes. As males mature they change from blue to a bright yellow color. Kenyi cichlids are considered an easy type of fish to breed in the home aquarium. Ideally, you should have around three to six females and one male in the tank for an optimal breeding colony. After spawning, a female will carry the eggs around in her mouth until hatching time, which usually takes around 3 weeks. To protect the female and the fry from any increased displays of aggression, you may choose to temporarily move them into a separate tank.